After months of being coy, Valve has finally announced some of the new game modes that will be featured in the upcoming Counter-Strike: Global Offensive. The new game modes Arsenal: Demolition and Arsenal: Arms Race are both based on a popular Counter-Strike: Source mod called Gun Game, in which getting kills with specific weapons in a specific order unlocks increasingly powerful weaponry. In fact, in true Valve style, the company is currently working with the team of modders who created the original Gun Game mod. The lead designer of the original mod, Michael Barr, seems rather pleased with all of this, saying, "We are excited that Valve reached out and is working with us to ensure Arsenal Mode is the best version of Gun Game." It all feels eerily familiar, what with Valve taking a well-loved mod and working with the original designers to create an official version of the game. I get the strangest feeling that the new Arsenal modes should include a jar of urine and silly hats. 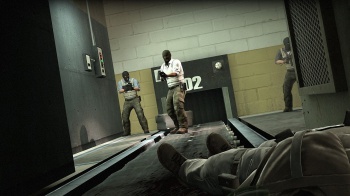 Counter-Strike: Global Offensive will be available for PC, Mac, 360, and PS3 sometime early next year. For those of you too impatient to wait that long, you could always try out the original Gun Game mod for CS: Source.